For the crust, blend graham cracker crumbs, sugar, and melted butter in a bowl until fully combined. Press mixture into a 9 inch deep dish pie plate, evenly covering bottom and pushing the crumbs about 1-2 inches up the side of the pie plate. Place the dish in the preheated oven and bake until set about 8 minutes. Remove from oven and let cool completely. In a large chilled mixing bowl, using an electric mixer, beat the 1 1/2 cups heavy cream until it holds stiff peaks. Set aside in refrigerator while preparing the rest of the filling. In the bowl of a stand mixer, using the paddle attachment, beat cream cheese until smooth. Add sugar and mix until blended. Add peanut butter and vanilla, mixing well and scraping the sides of the bowl with a spatula as needed. Next, fold whipped cream into the peanut butter mixture, combining well. Pour filling into the prepared pie crust and place filled pie into the freezer. For the ganache, in a small saucepan (use one with a lid), slowly bring the remaining 1/2 cup of heavy cream to a slight boil. Turn off the heat and add chocolate chips. Combine by pushing the chips into the cream until almost completely covered. Put the lid on the pan and let sit on the stove for 10 minutes. Next, stir until the chocolate chips are melted and fully blended into the cream. 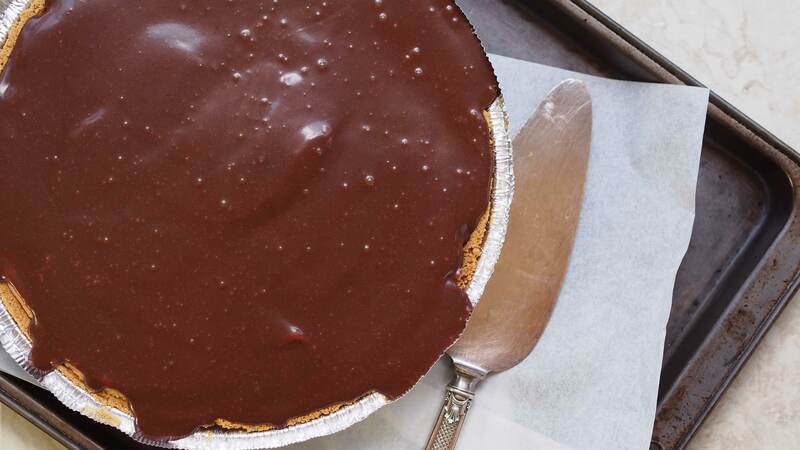 Cool to room temperature, then pour sauce over pie. Place in refrigerator before serving.